I came across this display at The Gap a few days ago. Not exactly subtle, eh? From skinny pretzels and skinny soda cans to skinny water (yes, skinny water) and Skinnygirl Margarita, courtesy of reality star, Bethany Frankel, we’re a culture saturated with messages about getting skinny, staying skinny, and as The Gap proclaims, remaining skinny by any means necessary. When body image activists call out products and advertising campaigns, like Urban Outfitters recent “Eat Less” t-shirt, for the irresponsible messages that cultivate, promote and reinforce unhealthy, even deadly, definitions of beauty, there’s always a backlash. We’re overreacting. We have no sense of humor. We must be ugly and bitter (after all, we’re jealous because we’re so damn ugly) if we object over the name of a pair dark-washed jeans or a bag or pretzels, the shape and name of a soda can or a brand of margarita mix. They’re harmless. Perhaps, one bag of pretzels or one protein bar named “Think Thin,” might arguably be fairly innocuous and benign, but these messages and images are not isolated or few. They’re one in a torrential flood of repetitive images and messages actively constructing our cultural reality through the process of cultivation, a theory proposed by media experts George Gerbner and Larry Gross. Cultivation is the building and maintenance of a stable set of images, a theory steeped in several longitudinal studies that assessed the behavioral and attitudinal effects of television. The studies revealed that long-term exposure of television shapes our ideas and concepts of reality; our expectations of others, our relationships, our dreams and goals and, ultimately, our view of ourselves. 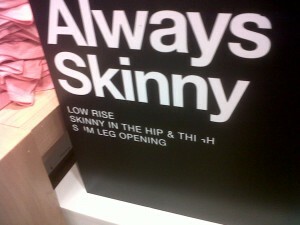 I’m not concerned solely with The Gap’s jeans campaign. I’m distressed how message after message, image after image, reinforces a cult of thinness. This cult of thinness is not limited by age, race, or class. It’s a message that is ubiquitous and celebrated in every aspect of our media culture. Thinness is one of the primary components of our beauty ideal, the primary and, often sole way, girls and women are valued and ranked in our culture. Am I taking these messages seriously? Absolutely. Am I taking them too seriously? Absolutely not. You can’t take these issues too seriously when 4th graders are dieting because they’re “scared” to be fat and women are dying. I vow to be “always critical” and always expose the potency of media messages. After all, they’re the water we swim in and the air we breathe.